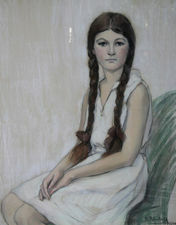 Hélène Polovtsoff (1888-1975) was born in Russia. Her parents were Vladimir Nikolayevich Okhotnikov (1847-1917), member of the State Council, and Princess Alexandra Nikolaevna Trubetskoi (1872-1954). Her first husband was Alexei Alekseevich Ignatiev (1877-1954), a lieutenant-general of the Soviet Army and author of the memoir "Fifty Years in Service"; her second was the public figure and writer, Lieutenant-General Peter Aleksandrovich Polovtsov (1874-1964). After the revolution, she left Russia and settled with her second husband in Monte Carlo in 1922 where she painted portraits of the local nobility. Her talents were recognised in France and she participated in the Autumn Salon in Paris (1927, 1958, 1959) and the Salon of Independent Artists (1958, 1959). She held solo exhibitions in the Paris galleries of Hector Brame (1930) and Bénézit (1947) and was also a member of the Ladies' Society in Memory of the Empress Maria Feodorovna. Polovtsoff was a parishioner and philanthropist of the cathedral of the Mother of God 'Joy to All Who Sorrow' in Menton. She is buried in Monte Carlo.